I will honestly admit that I did not grow up a soccer fan. In the US, soccer is a very popular sport played by kids, as proven by the popularity of the “Soccer Mom”. But, as kids grow up, they seem to stop playing soccer and move on to other interests. And, the best teams in the US seem to be women’s teams. The US does have a professional soccer league, MLS – Major League Soccer, but their popularity is only found in the cities in which they play and are teamed with the more aging players in soccer from the more prestigious European leagues. 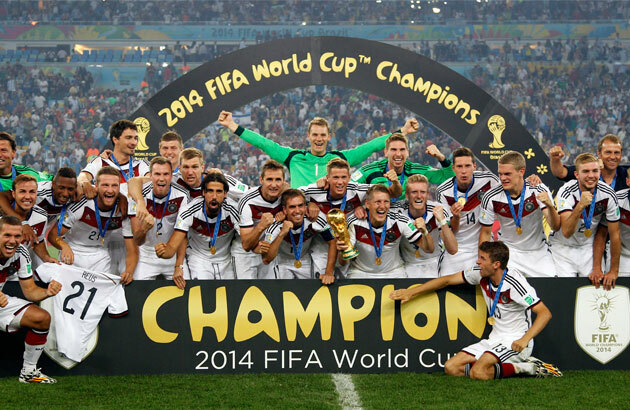 Now, being a huge sports fan, I knew of the World Cup. I would occasionally watch a match in year’s past, but never gained a real interest. Fast forward to our time living in Germany, and I have started to really like watching the game that I now call futball (or Fußball for my German friends). The interest started when watching the 2012 Champions League finals when the final game was fielded by two German teams (Dortmund vs. Bayern Munchen). But, the creme de la creme of futball is by far the World Cup, which I learned is the most watched sporting event in the world. This year, I watched all of the matches involving the German and the American teams. I really started to understand the rules, even the offside penalties. And, am now able to see the strategies involved and the drama that builds while watching these matches. The best thing about the German team winning is that it brought out the national pride of many Germans with many people wearing or waving the German flag and colors. As an American, I am use to seeing the American flag and colors displayed back in the States. But, the German flag or colors are not as prominently on display here. And, with each victory, you saw more and more of the black, gold, and red colors of the German flag proudly being shown. 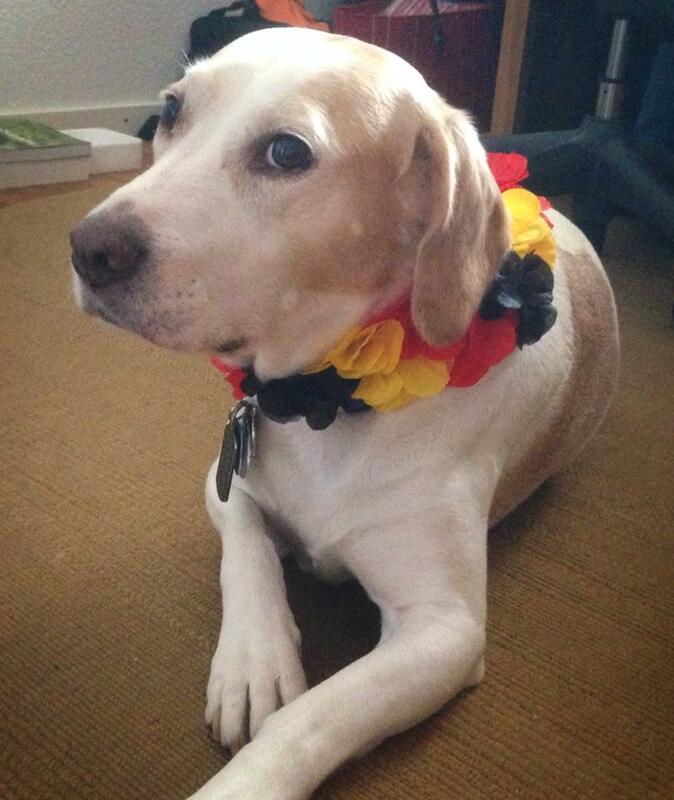 Even Barney got into the German spirit!! Also, living in Germany, it is fairly a quiet place to live primarily due to the “noise regulations” that are in place to prevent noise pollution. But, after a victory, even at 2am CET, many fireworks and car horns would ring in the celebratory noises that filled the summer nights during late June and into July. 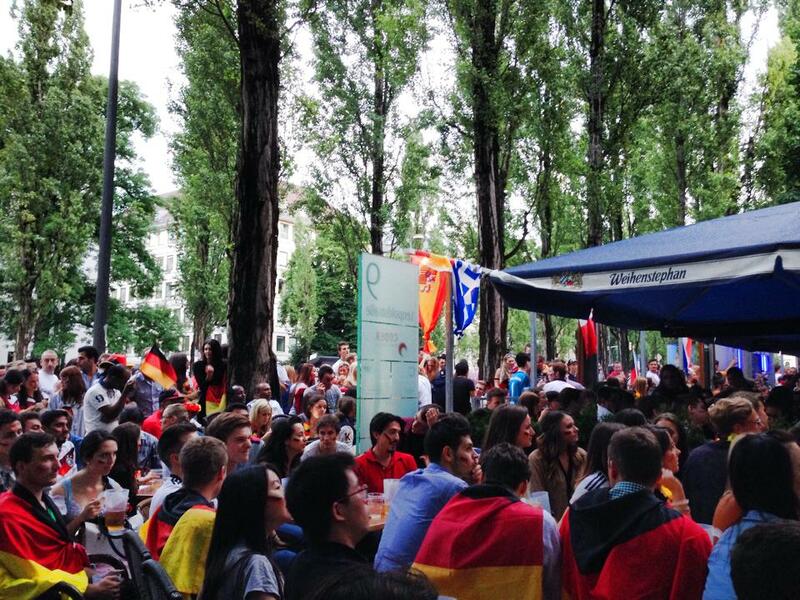 So, by the time Germany had made it all the way to the World Cup Final game against Argentina, my American friends who are also here in Germany, we wanted to travel to a city to watch the match in an outdoor viewing party. Our first choice was traveling to Berlin, but being a 4 hour train ride, we knew that was going to be a challenge. So, instead, we decided to go to Munich, which is a 2 hour train ride away. 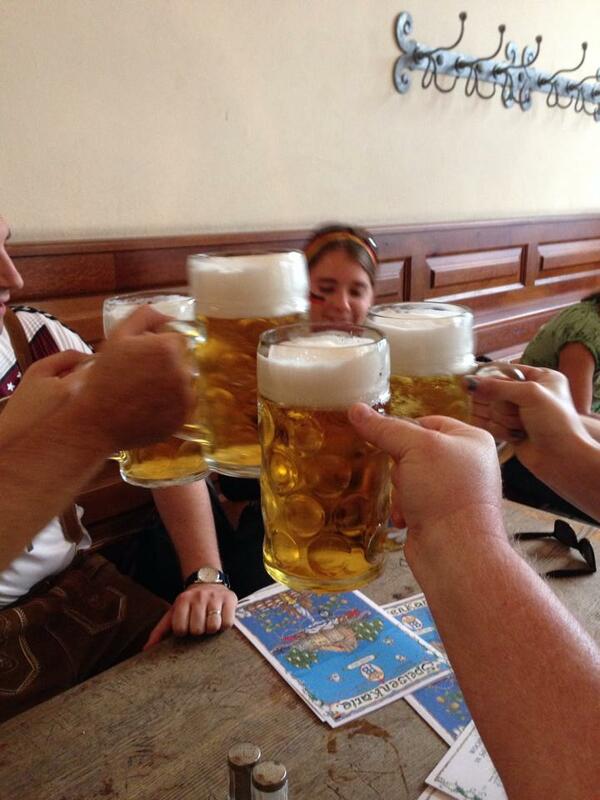 Six of us left the train station in Mannheim at 9am and arrived in Munich around 11am. 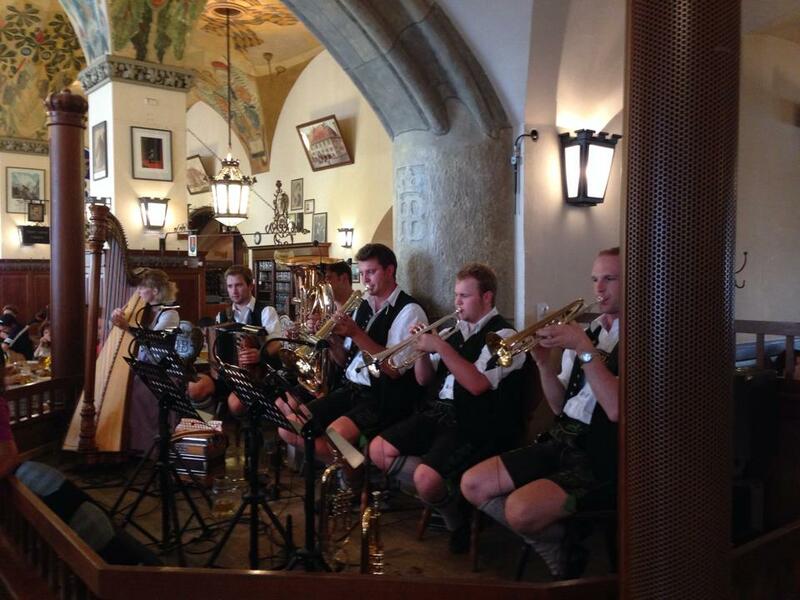 We checked into our hotel, and then headed out to sight-see Munich, enjoying a lunch and several beers at the famous beer garden Hofbräuhaus. The bratwurst, sauerkraut, pretzel, and beers were so delicious. Munich is a touristy city with many visitors from outside Germany there. 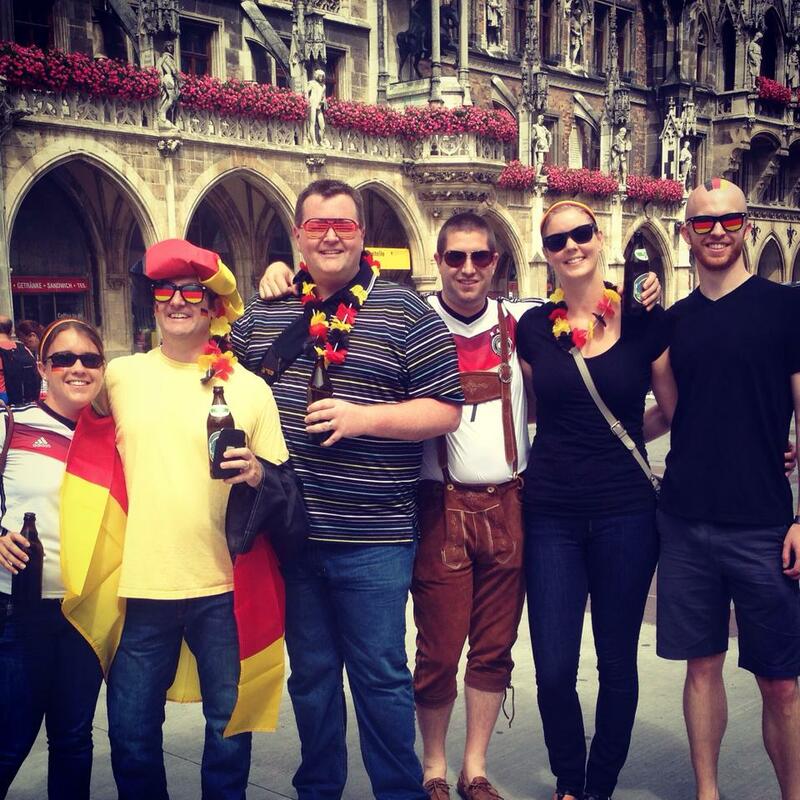 Our group was asked to have pictures taken several times, as we were dressed in German colors. Then, after each picture, we would tell them, “Hey, we are not German.” – but they did not care because we really looked the part. 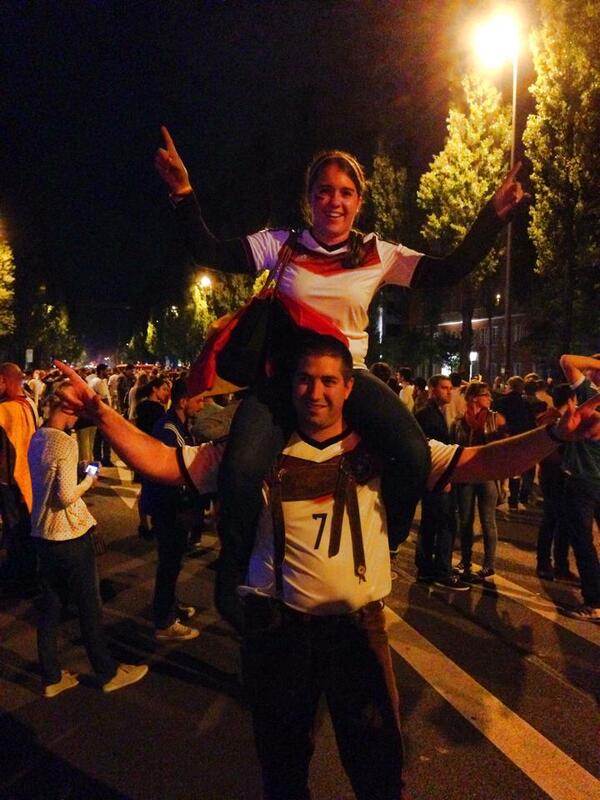 To show our spirit, we wore the German colors. 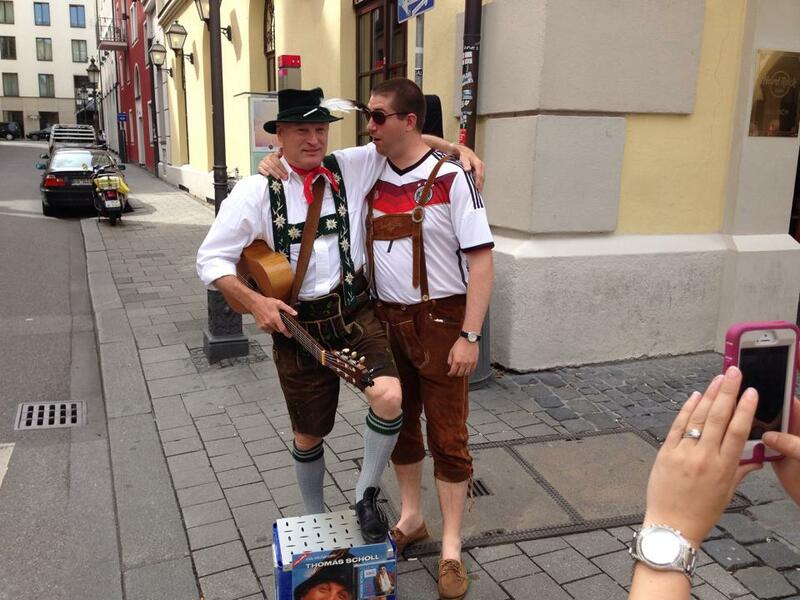 Heck, even Eric brought his lederhosen. People would stop us, and ask to have their picture taken with us. After pictures with 5 different people, we decided to move on, or at least start soliciting tips for pictures taken. 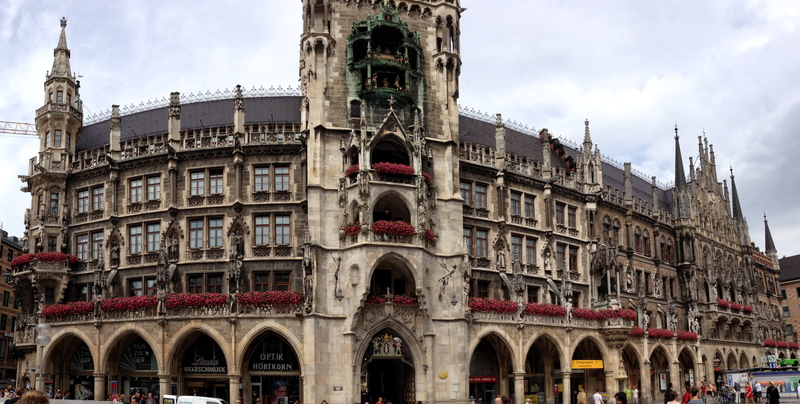 Rathaus (Town Hall) in the center part of Munich. 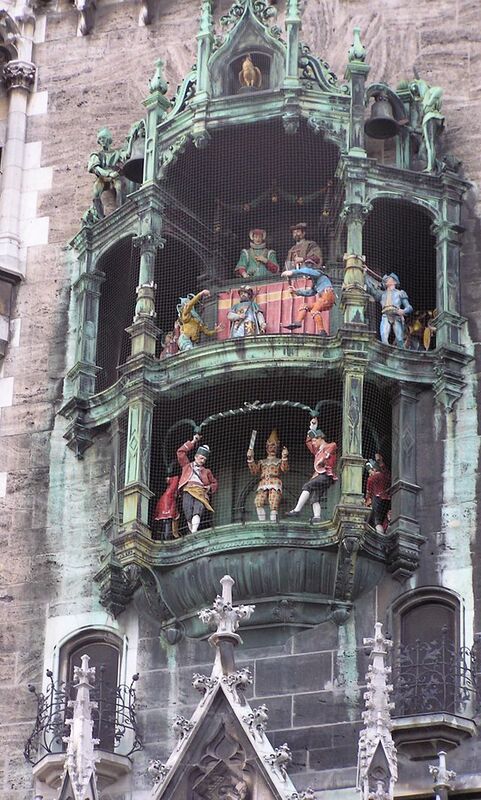 Close-up of the Glockenspiel at the Town Hall. Every day at 11 a.m. (as well as 12 p.m. and 5 p.m. in summer) it chimes and re-enacts two stories from the 16th century to the amusement of mass crowds of tourists and locals. It consists of 43 bells and 32 life-sized figures. We did not have a set place to go, so we took the subway over and walked down Maximillianstraße, one of the main streets of the city, where we met up with four other of our friends who were in Munich also. There were still about four hours until the match started, and all of the bars were already full. After some smooth talking by our friend Steve with the owner of one of the bars, we were setup with a sweet arrangement outside along the perimeter of the outdoor area. At first, it looked like we may not have that good of a view of the match, but as night approached, we could easily see the projected screen. And, since no one was behind us, we did not feel that enclosed in with the hundreds of people there watching. 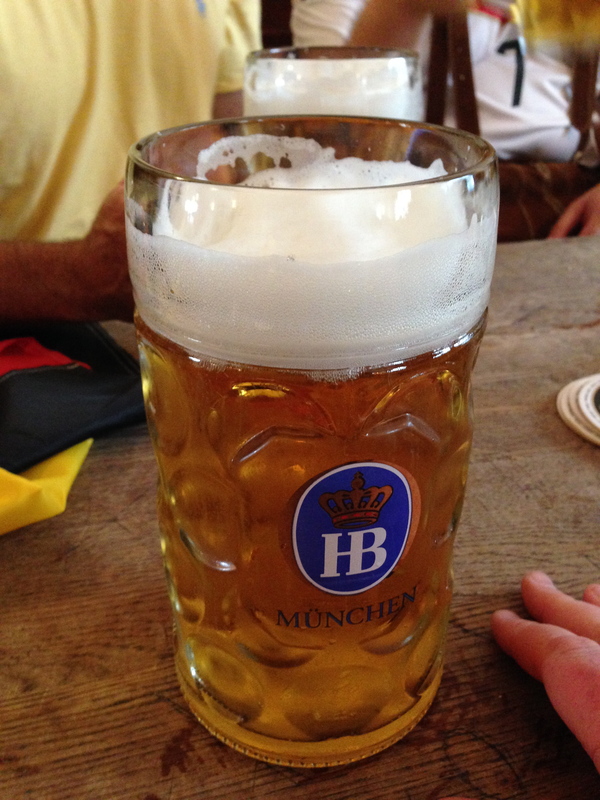 Liter of beer at the Hofbräuhaus…one of the oldest beer halls in Munich, built in 1589! Inside the Hofbräuhaus hearing some folk Bavarian music. 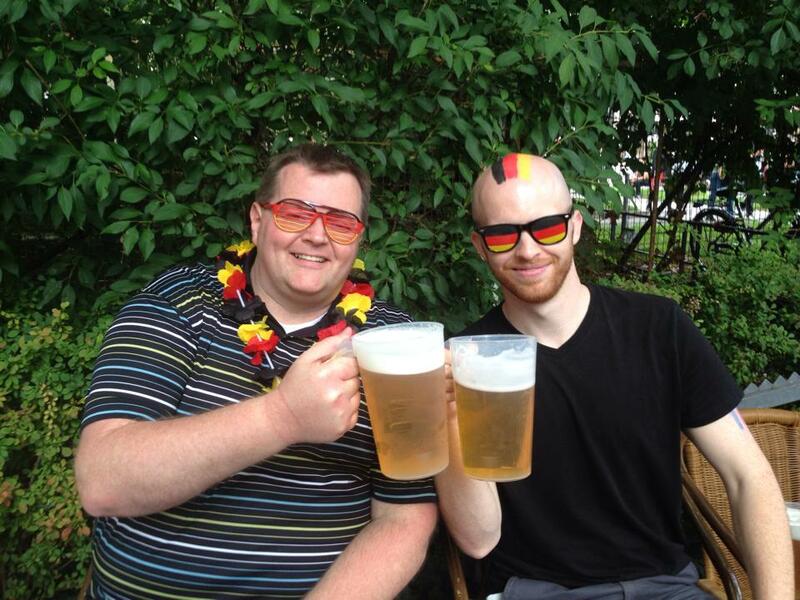 With four hours until the match, that gave us plenty of time to enjoy quite a few of the liters of beer being served. Needless to say, as the match started, everyone was in a very joyous mood. During the match, you would hear screams coming from up and down Maximillianstraße. 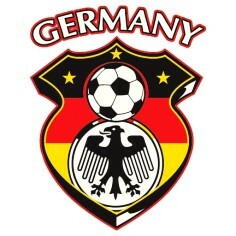 And, then by the end, in extra time, Germany was able to pull off the 1-0 victory. 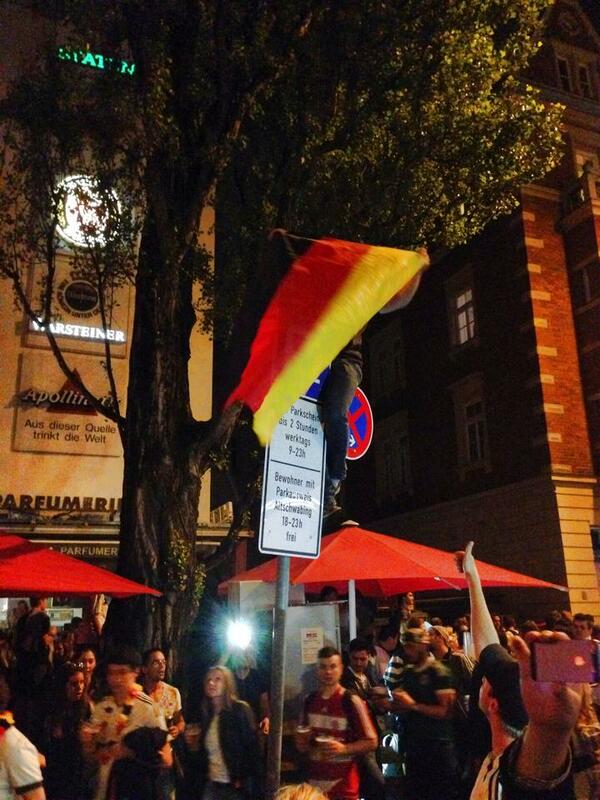 With that, where ever anyone was watching the match, it felt like everyone at once descended onto Maximillianstraße! 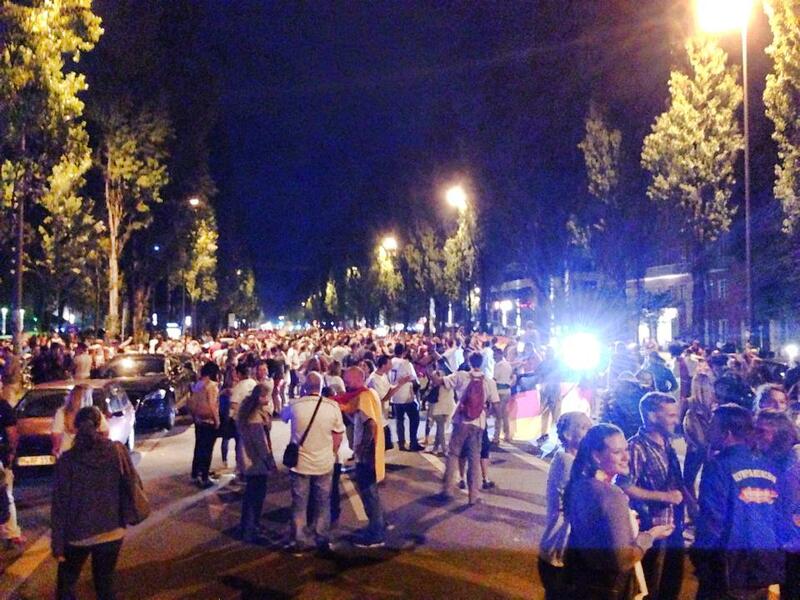 In a mere 5 minutes, the street was filled with wall-to-wall people yelling, chanting, and enjoying the victory. Easily tens of thousands of people as far as you could see with people climbing up street signs and trees to scream at the top of their lungs. We made it a point to somehow get into the middle of the street and you could feel the press of people all around. Surprisingly, of the six of us, we only lost two in the crowd. I need to learn the words to the German National Anthem. 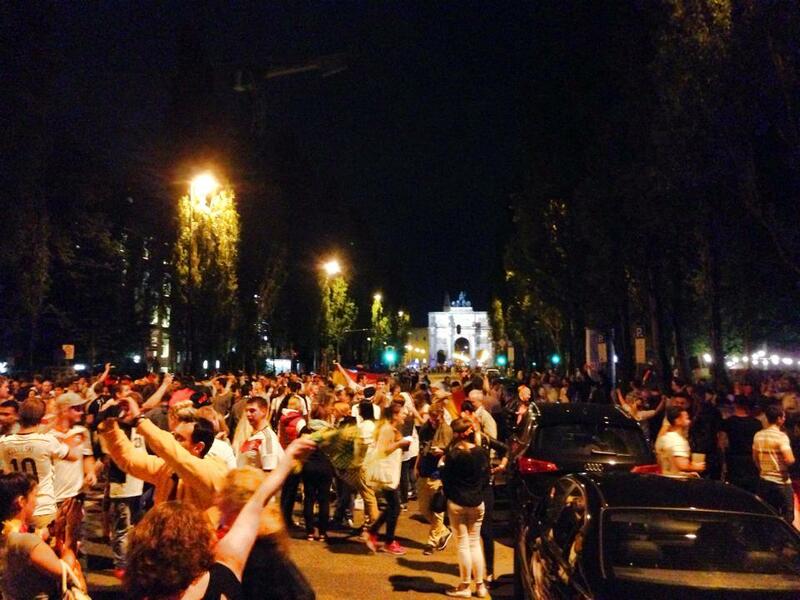 Out on the streets celebrating the victory about 10 minutes after the end of the match….it got really crazy!! Where else can you get a good view of the crowd than by climbing on top of a street sign? After some fireworks were set off almost immediately behind us and with no way to quickly leave the scene, we decided that we should start to more off more to the side and watch from there. We eventually made our way back to the hotel at about 2am, and you could still hear car horns and people yelling as I went to sleep. We woke up the next morning after a few hours of sleep, walked to the train station for our return trip back to Mannheim. 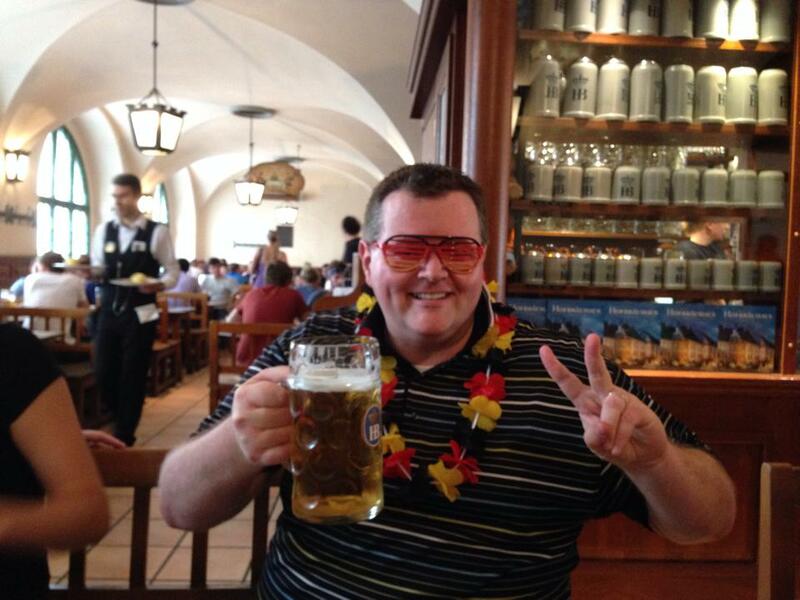 It was a fun, crazy, and exciting 24 hours…and Germany can declare that they are the world champions…or Deutschland ist Weltmeister! !